It is March, 1599. William Shakespeare has just arrived at the house of Richard Burbage, his producer, to discuss a new play. With plots, characters and sweet poetry whirling through his head, Shakespeare is nervous at the prospect of selling his vision and yet he is in equal parts excited by the ideas that rest in his heart, yearning to escape to the sanctuary of the page. "So William, what have you got for me this time?" bellows the great figure of Burbage, as he pours himself what must be his fifth sherry of the morning. The Bard starts to speak but is immediately interrupted by his illustrious patron. "Now don't give me all your normal rubbish. Last time you went off on an half-hour-long speech about revenge and the nature of the human mind. Then all I ended up with was some bloke talking to a skull. Forget all your silly hype and just describe your play to me in one sentence." Shakespeare pauses for a while to contemplate this unexpected task. After much pondering and fiddling with his freshly-trimmed beard, he is ready. "My lord," he respectfully begins, "my intention is to write a show about nothing." Jerry of Padua - A lord and successful military officer, renowned for his joke-filled speeches to troops. Giorgio of Constanzia - A lord and friend of Jerry, going back to their days in military school. Franco of Constanzia - Giorgio's father. Leonato - Governor of Messina. Susan - Daughter of Leonato. Betrothed to Giorgio. Bennice - An orphan. Niece of Leonato. At one time had a relationship with Jerry, but are now just friends. Don Newman - Trusted messenger of the Leonato household. Enemy of Jerry. The play starts with Jerry, Giorgio, Bennice and Cosmo wandering the streets of Messina, hopelessly lost. Every street looks like the last and the group have no idea where they have left their carriage. Jerry and Bennice walk the streets arguing over where to go and where they have just been. Giorgio, meanwhile is worried that he will miss a pre-wedding dinner with his parents. Furthermore, he has yet to figure out how to get out of the wedding. Cosmo tries to lighten the mood by suggesting that Bennice can transport them back home, inviting her to "giddy up, my lady". The party return home. They are greeted by Bennice's uncle Leonato who invites them to a masked ball. This is to be held in the garden, so lovingly designed by Bennice's cousin, Jeffrey. Giorgio apologises to his parents for missing dinner, assuring his mother in the process that he does not need to see a psychiatrist, whatever that is. All the characters leave the stage to prepare for the party, with the exception of Don Newman. In the following soliloquy, Don Newman professes his "hatred for the funny man". He vows to humiliate and ruin Jerry. Control the mail, control information. At the masked ball, Don Newman puts his plan into action, informing Jerry of a fair maiden who is eager to make his acquaintance. Don Newman then tells the audience, that the fair maiden in question is Giorgio's beloved Susan. He then finds Giorgio picking his nose. Instead of sending for Susan as Giorgio requests, Don Newman brings Jerry's wooing of Susan to his attention. Naturally, Giorgio flies into a rage and breaks off the engagement. However, Don Newman is disappointed when Giorgio does not blame Jerry and there is no duel. The next day, Leonato is despairing at how he has yet to get either Susan or Bennice married off. Cosmo, offers his help, wagering that he can get both ladies a husband. First he plans to bring Giorgio back to Susan, by having her fake her death by poisonous letter-sealing wax. Secondly, he plans to set up Bennice with Jerry. Meanwhile, Bennice ponders whether or not one of her current suitors is a Moor. On hearing from Cosmo of Susan's death, Giorgio curses his luck at missing out on any inheritance and considers going back and pretending the break up had never happened. However, he gives up the idea upon realising he might have to contribute to Susan's foundation. Jerry also turns away Cosmo's matchmaking attempts, arguing that "The o'er-leaping ambition of Icarus could not top this mount. Foolish is he who seeks this, that and the other". The next day, Cosmo goes back to Leonato and declares that the bet's off. He's not doing it anymore. In the final act of the play, Leonato takes up the matchmaking himself, Jerry borrows a pen, there's fights and drama, yada yada yada, it all works out in the end. One constant theme running through the play is the characters' worrying and nit-picking ways. At the start of the play, Jerry casts aside a potential romance with an unseen character, Rosaline, under the pretence that "she does eat her peas one by one". This also reflects in the way that the characters dismiss chances of happiness, one by one. Later on, Jerry does not take Cosmo's matchmaking seriously, and instead is more interested in his shirt, asking "dost thou not see how I am all puffed up?" This self-interest (further exemplified by Giorgio's worries that he may be blamed for Susan's death), blinds the characters from emotional development, explaining the noticeable lack of hugging or learning in the play. At the beginning of the 21st century, several critics suggested that the relationship between Giorgio and Jerry is one of Shakespeare's characteristic subtexts of repressed homosexuality. At the start of the masked ball, the two are mistaken for a couple, which they quickly deny upon revealing their identities to the maiden in question. While some critics point to this incident as merely a comedic demonstration of the confusion at the ball, the sexuality point is further enforced with the characters qualification that while they're not gay, "Forsooth, there is not a thing wrong with that". It can also be argued that Cosmo is referring to Jerry's sexuality in act 2 scene 3, when he describes him as "thin, neat and single". 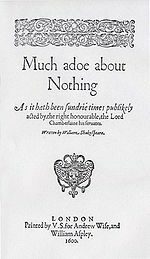 Much Ado About Nothing is regarded by many as Shakespeare's anti-play. Conventional actions and feelings expressed in the theatre are cast aside. Giorgio actively attempts to avoid marriage, inverting the norm where characters fall in love. When Jerry and Bennice eventually pursue "this that and the other", they do not follow their hearts. Instead, they follow a set of rules. In "Much Ado", Shakespeare expresses the idea that not everyone is the same; some people lead shallow and pointless lives. Many great actors have taken on the parts over the years. Derek Jacobi's Giorgio is widely considered to have been the greatest of all. The dynamic energy, pitiful insecurity and utter shamelessness he brought to the role proved Jacobi to be a true master of his domain. Reflecting upon his lifetime in Shakespeare, Sir Derek considers Giorgio to have been his most highly demanding role. "Giorgio is unique in that he's not the hero with a tragic flaw. He's the loser. That is what one has to grasp. To be faced with love and turn the other way, to look death in the eyes and still worry about your worthless little self, to feel... nothing. That is the challenge," he says. Sir Ian McKellen faced his own challenge, when playing Jerry in the Royal Shakespeare Company's 1971 production. "For me it was all about one line," he recalls "the power of the hatred, the depth of feeling, all had to be summed up by the simple words: "Good morrow, Newman."